Why are some ads effective? 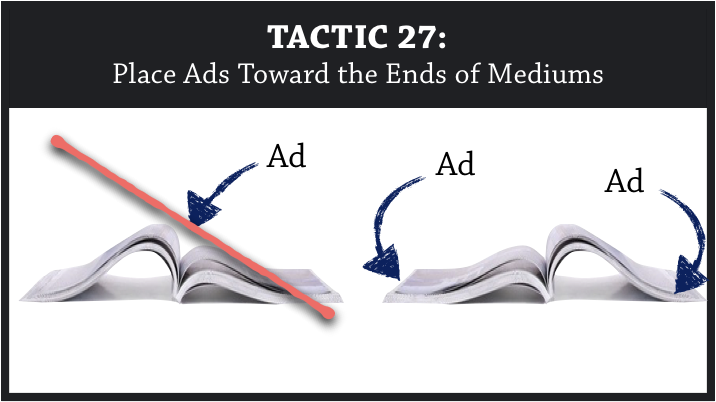 This guide explains 27 tricks that advertisers use to influence your perception. Welcome to a huge guide on advertising psychology. However, this guide will focus on static advertisements. Whether it’s a print ad for a magazine or a banner ad on Facebook, you’ll learn psychological tricks that make it more effective. PDF Bonus: This article is 6,279 words. Click to download the full PDF so that you can easily reference it. An advertisement usually contains three elements: images, words, and a brand/logo. What types of images should you use? The ideal characteristics will usually vary, depending on your product. But this section will describe tactics that should work for any advertisement, regardless of your product. “…a stimulus presented in the left visual field (LVF) is initially received and processed by the right hemisphere (RH), and a stimulus presented in the right visual field (RVF) is initially projected to and processed by the left hemisphere (LH)” (Bourne, 2006, pp. 374). 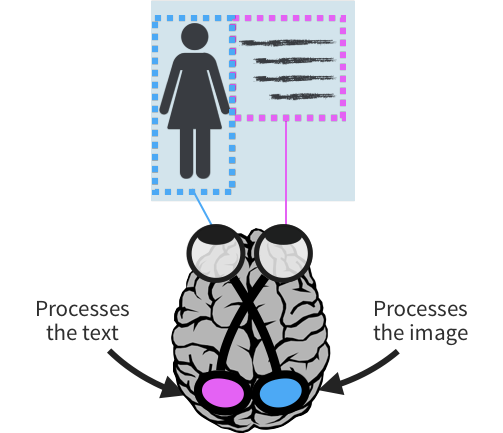 “Because the right hemisphere is better suited to process pictorial information and the left one is more logical and verbal, placing the image on the left hand side of the text enhances the processing of the whole message” (Grobelny & Michalski, 2015, pp. 87). When you place images and graphics toward the left side of your ad, you increase processing fluency. People will digest your ad more quickly, generating a more favorable evaluation (Alter & Oppenheimer, 2009). 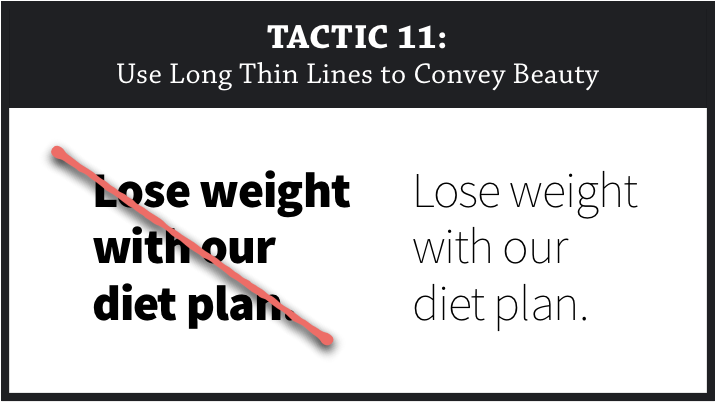 If you only read one tactic in this article…read this one. This tactic is (a) very powerful (b) easy-to-implement, and (c) virtually unused by most businesses. When businesses create product images, they often depict the product without much thought. Starting now, always depict your product so that you achieve an underlying goal: to encourage mental interaction. Here’s an example. Elder and Krishna (2012) showed participants an ad for a coffee mug. Turns out, participants were more likely to purchase the mug when the handle was facing the right (toward the dominant hand of most people). “…when participants have their dominant hand available, the corresponding visual product depiction leads to higher purchase intentions; however, when the dominant hand is occupied, the effects are reversed” (Elder & Krishna, 2012, pg. 9). That’s great, Nick. But my product doesn’t have a handle. You could use those images anywhere (e.g., advertisements, eBay, eCommerce site). In most cases, those images will make your product more appealing because they’ll increase the amount of mental interaction. As humans, we experience an inborn tendency to follow people’s gazes. That trait helped our ancestors discover threats more easily. And, thanks to evolution, that trait is still ingrained in our amygdala (Emery, 2000). Some nonprofits or charities might benefit from those front-facing images (I explain why in my article on stock photos). 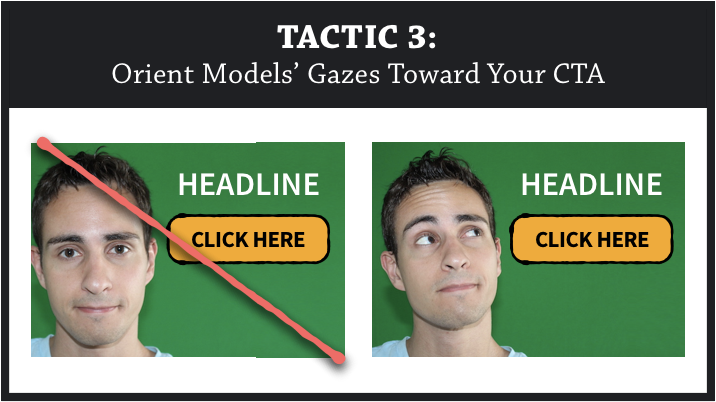 However, you should usually orient model’s gazes toward your CTA. Do attractive people really enhance the persuasiveness of an ad? Unfortunately, yes. You’ll usually trigger a more favorable evaluation of your product when you show attractive people (Trampe, Stapel, Siero & Mulder, 2010). Which products are relevant to attractiveness? Here are some examples. It also depends on your positioning. For example, some brands might use an artistic positioning for their home décor products. In that case, an attractive model might fit naturally within their ad. For most brands, however, an attractive model would seem irrelevant. Trampe et al. (2010) didn’t explain why you need relevance. But here’s my guess: irrelevant products reveal your underlying motive. 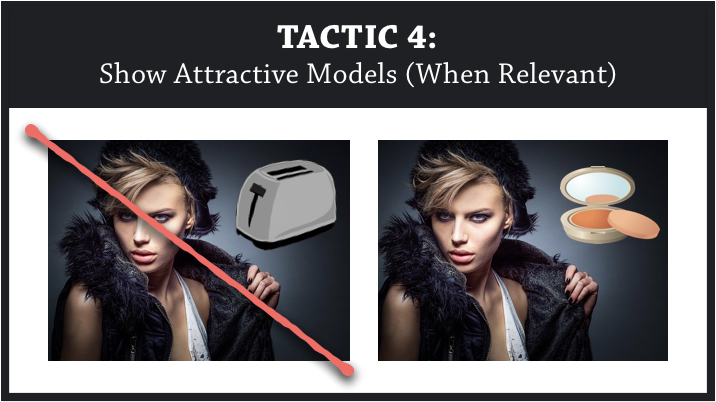 If you use an attractive model to sell a toaster, people will know that you’re merely trying to persuade them. So they’ll experience psychological reactance and fight your persuasion attempt (Brehm, 1966). The main takeaway? Attractive models usually enhance persuasion, but you need a relevant product to disguise your persuasive motive. Wording is also crucial. 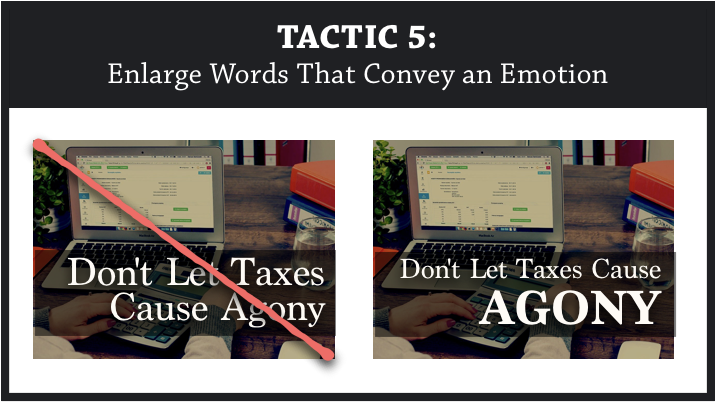 In my copywriting article, I explain a list of tactics to make your writing more persuasive. In this current article, you’ll learn some new tactics that are specifically geared toward advertising. Images trigger emotion in accordance with their size. The larger the image, the stronger the emotion (De Cesarei & Codispoti, 2006). Words are different. They’re symbolic in nature. People need to decipher the meaning of a word in order to experience an emotional reaction to it. Given that symbolic nature, can wording size play a role in emotional impact? Turns out, it can. By increasing the surface size of your text —especially emotional words — you’ll enhance the emotional impact of those words (Bayer, Sommer, & Shacht, 2012). Thus, not only will your enlarged words produce a stronger impact, but they’ll also capture attention more easily. Similarly, people perceive long lists of features to be more persuasive than short lists (Petty & Cacioppo, 1984). There’s a caveat, however. People often overestimate their usage of features. Most people prefer paying flat fees (versus paying per use) because they overestimate the amount that they’ll use a product (Nunes, 2000). In fact, a long list of features can backfire if consumers consider their usage. When consumers think about their usage, they shift their preference toward products with fewer features (Goodman & Irmak, 2013). Avoid describing the usefulness or practicality of features. Instead, mention that your product has the capability. In my copywriting article, I describe the danger of assertive language. 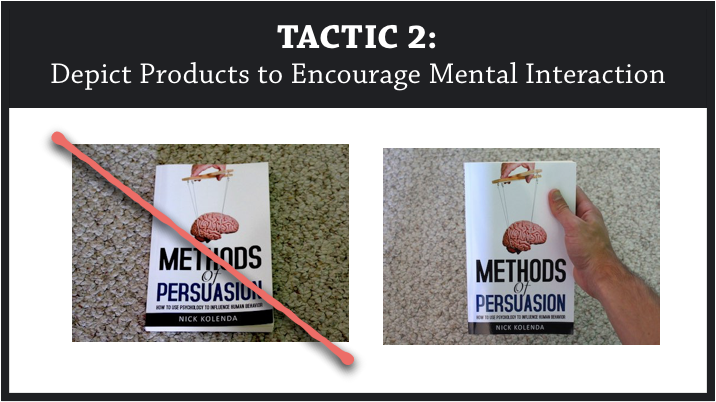 If readers feel like you’re trying to persuade them, they might experience psychological reactance (and they’ll fight your persuasion attempt). But there’s an exception. Assertive language can improve advertisements for hedonic products (Kronrod, Grinstein, & Wathieu, 2012). When people feel happy, they talk more assertively (and expect people to speak more assertively). And those expectations are the key. Because consumers will expect assertiveness, your assertive language will increase processing fluency. 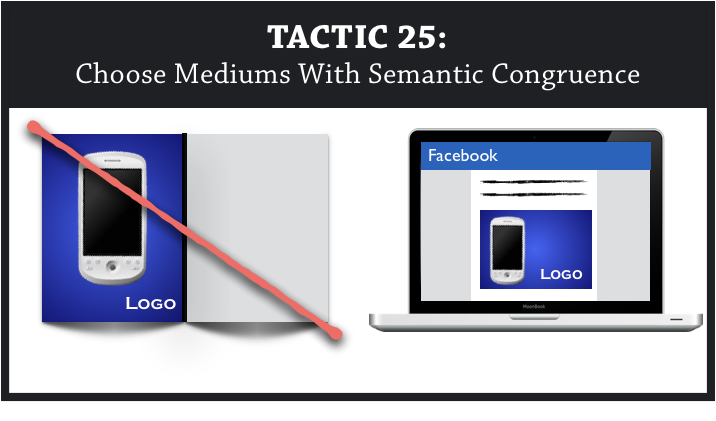 They’ll be able to process your ad more easily — which will produce a pleasant sensation. That pleasant sensation will then be misattributed to your product (Alter & Oppenheimer, 2009). 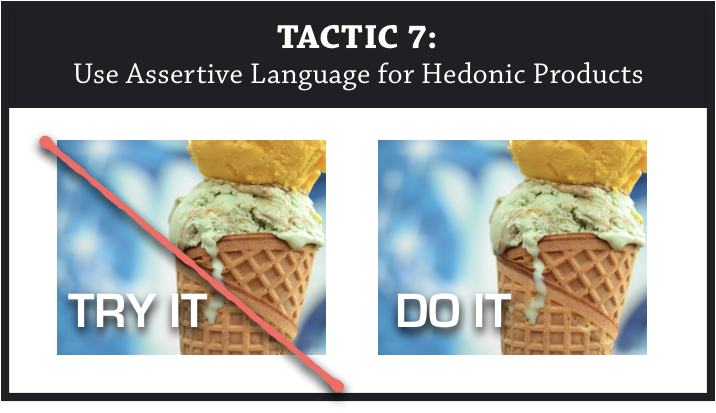 The previous tactic showed that assertive language can increase processing fluency for hedonic products. The same effect also occurs with rhyming. But that effect occurs for any product. In fact, a simple rhyme may have dictated the outcome of the O.J. Simpson trial: If the glove doesn’t fit, you must acquit. Rhyme: What sobriety conceals, alcohol reveals. No Rhyme: What sobriety conceals, alcohol unmasks. Both statements are essentially the same. But students found the rhyming statement to be more accurate and truthful. Why? Because it increased fluency. When evaluating that statement, students experienced a pleasant sensation, which they misattributed to the underlying information. Be a dove, show some love. Want a tour? Drop by our store. Those rhymes will subtly create a pleasant sensation. People will then misattribute that pleasantness to your call-to-action, and they’ll experience a stronger desire to complete it. Your logo or brand is another integral part of an advertisement. In this section, you’ll learn how to enhance the perception of it. 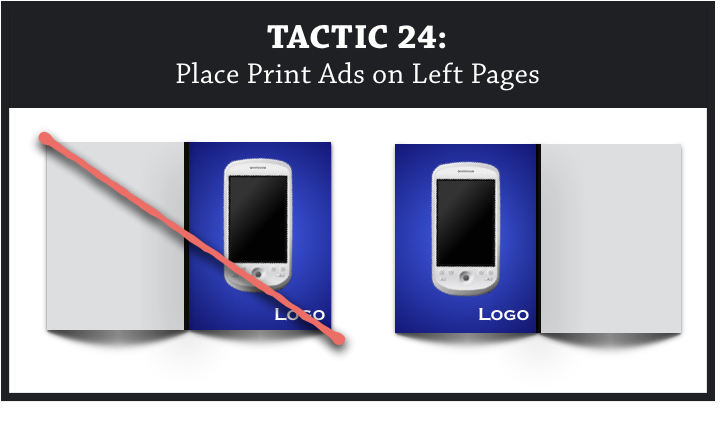 In the first tactic of this article, you learned why you should position images toward the left of your ad. With that position, your brain’s right hemisphere can process the image more easily. Here’s a related tactic. If your imagery consumes a large portion of your ad, then you should position your brand to the right. That suggestion is due to the matching activation hypothesis (Janiszewski, 1990). If your image is large, then people will be processing the ad primarily with their right hemisphere. Their left hemisphere will be less activated. According to the matching activation hypothesis, less activated hemispheres are still active. They subconsciously elaborate on the information at hand. And that nonconscious elaboration produces a favorable response toward the information. I realize that explanation might sound complex. 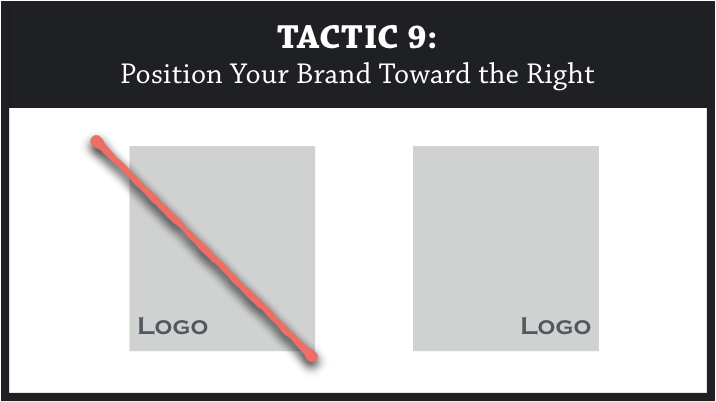 So here’s a separate — yet simpler — reason to put your brand on the right. Other research has found that information on the right generates higher aesthetic scores (Grobelny & Michalski, 2005). So people should perceive your brand to be more aesthetically pleasing. Some advertisers recommend decreasing the size of your brand. The visual appearance of a brand can make your content look promotional, reducing the persuasiveness of your ad. And it makes sense. Before doing this research, I probably would have agreed with that claim. However, I finished scouring the research. And that claim is inaccurate. And the effect isn’t just neutral. Other research has found a positive effect from increasing the surface size of a brand. 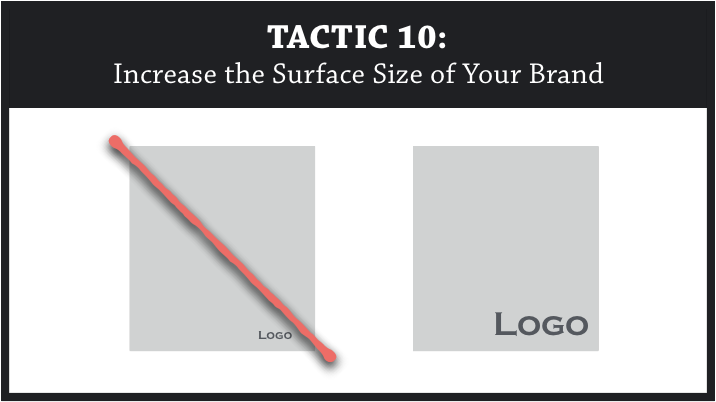 Bottom line: don’t be afraid to increase the size of your brand or logo. The previous section explained the best content to use in your ad. But how should that content appear? Which fonts and colors should you use? This section will tackle that question. Never overlook your fonts. Visual characteristics in fonts can trigger certain emotions in viewers (Henderson, Giese, & Cote, 2004). So fonts play a powerful role. There are other factors too. But those are the big three. Ideally, those visual characteristics should match the conceptual characteristics that you want to convey in your product. In other words, the optimal font will be semantically congruent with the product that you’re advertising (Childers & Jass, 2002). Sound like mumbo jumbo? Don’t worry. By the end of this section, you’ll know how to choose the optimal characteristics (i.e., line, weight, and orientation) for your font. Once you understand the examples, you’ll be able to apply the same principles to any product that you’re advertising. But why is that? And how could any font possess personality? Well, the answer can be found in your brain’s associative network (Anderson, 1983). Everyone has a preconceived notion of beauty — what it is and what it looks like. In most countries (especially the US), beautiful people are tall and slender. That’s the “standard” for beauty. Even if you don’t believe in that standard, you still associate those qualities because of the cultural stigma. That activation gives you a new temporary lens. 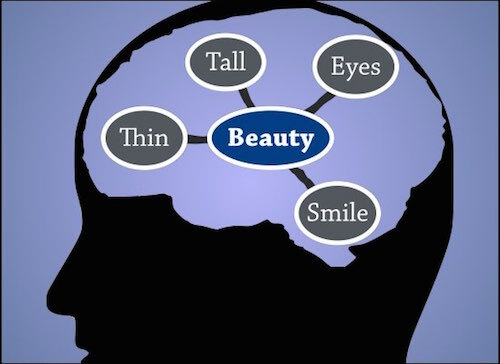 With your concept of beauty more prevalent, you perceive stimuli in the immediate environment to be more beautiful. And that’s the answer. If you want to choose a beautiful font, then incorporate visual characteristics that are associated with the concept of beauty. In other words, choose fonts that appear tall and thin. Those perceptual characteristics will trigger spreading activation toward the recipient’s node for beauty. That heightened activation, in turn, will make your font (and surrounding stimuli) seem more beautiful. In addition, that semantic congruence will increase fluency for your font (Doyle & Bottomley, 2004). People will be able to process your font more easily, thus generating a more favorable evaluation of it. Suppose that you’re advertising a diet plan. If you want to convey that your solution will make people feel beautiful, then use long thin fonts. This tactic used beauty as an example. But you could use the underlying principle to choose any font. 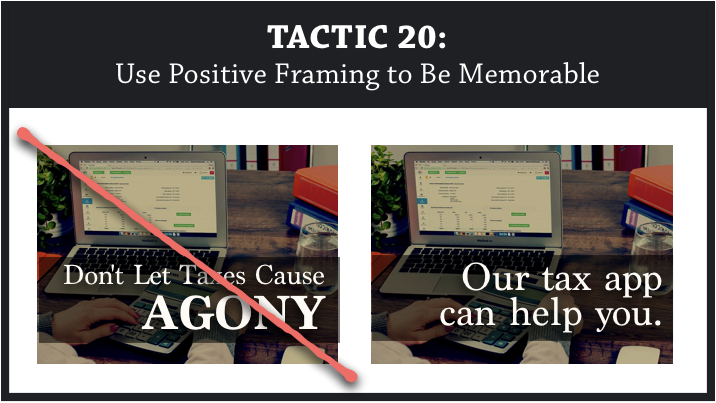 Here are a few more tactics to help you apply that principle. Suppose that your product is unique, distinguished, or luxurious. Or perhaps the marketplace is crowded. And you want to stand out from competitors. Your font should match the perceptual characteristics of being unique. 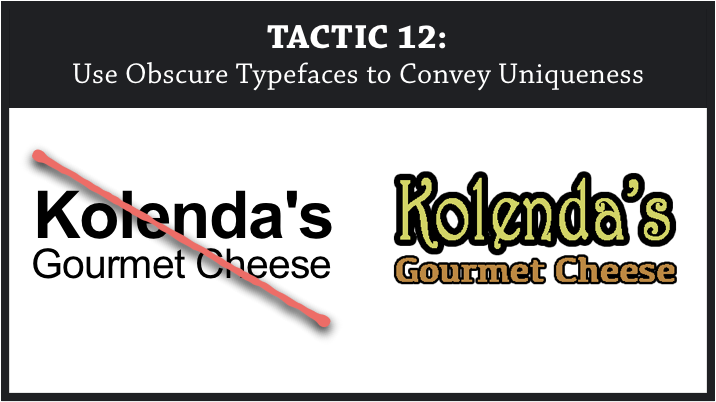 Because participants had trouble processing the font, they attributed that difficulty to the uniqueness of the product (thus enhancing the perceived value of the gourmet cheese). If you want to position your product as unique or high-end, then decrease the fluency of your advertisements. Use an obscure — yet still legible — font so that people experience some difficulty processing the ad. In addition, when people exert greater effort to process your ad, they’ll encode the memory in greater detail (Alter et al., 2007). So not only will obscure fonts enhance the perceived uniqueness of your product, but they’ll also create a stronger memory for your brand. So choose a font with a slanted orientation. Although you could choose a font with a tilted design, it’s not necessary. Italicizing your font should do the trick. Color is a touchy subject. Even though researchers have found some interesting (and practical) insights, most people are only familiar with the pseudoscientific claims — not the accurate science. Unfortunately, though, color is a huge topic (too big for this article). I’ll explain a full list of applications in a future article. This section will simply focus on a few key tactics. Because of those associations, red activates an avoidance mindset. With that mindset activated, people identify problems more quickly and easily. 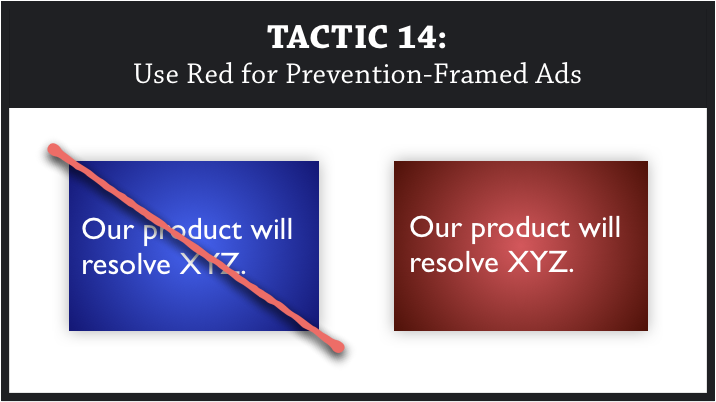 So if your ad is negatively framed (i.e., you describe a problem that your product resolves), a red color scheme will trigger a stronger desire for your product (Mehta & Zhu, 2010). What if your ad describes tangible benefits of your product? In that case, use a blue color scheme. Prevention Frame: It’s good for cavity prevention. Gain Frame: It’s good for teeth whitening. The results were consistent with the learned associations. Red colors performed better with the prevention frame, whereas blue colors performed better with the gain frame. Some advertisers argue that color always outperforms black-and-white. But that’s not the case. When your ad contains substantial text content and vivid colors, viewers feel overwhelmed with stimuli. As a result, they feel less motivated to process the contents of your ad. If your ad contains a lot of text, lower the brightness or saturation of your colors. 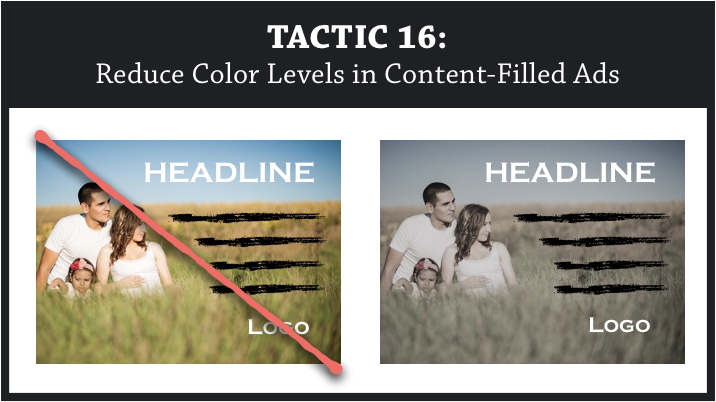 By reducing the color levels, you’ll motivate more people to evaluate your ad. And the text will usually be easier to read as well. So far, we’ve examined the content and visuals of your advertisement. Now let’s look at the context and environment. Specifically, you’ll learn the ideal framing, variations, and medium. Framing always sparks a heated debate. Should you use a rational argument or an emotional appeal? Should you use negative or positive framing? Those questions haunt advertisers. Unfortunately, a clear answer doesn’t exist. The best solution will always depend on various factors. But this section will shed some light on those factors (and when particular frames are more effective). 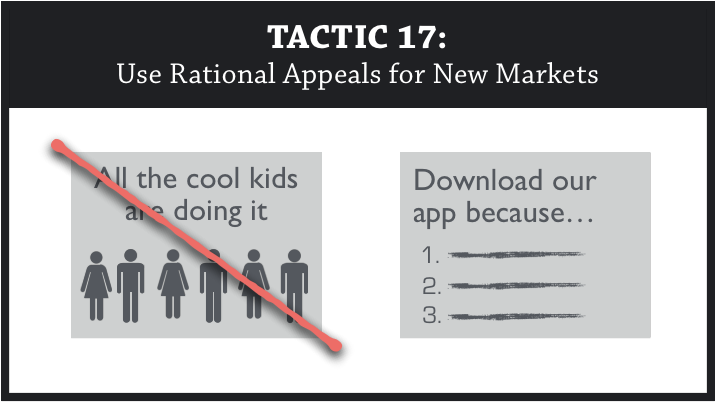 If your product is new or innovative, consider using a rational appeal in your advertisement. If consumers aren’t familiar with your product, they’ll process your ad in greater detail. 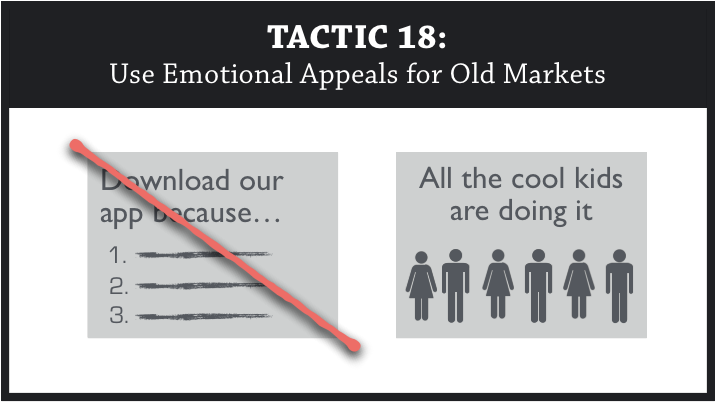 Because they’ll be devoting more attention and cognitive resources to your ad, emotional appeals are less effective. They need a rational reason to consider your product. With familiar products, an emotional appeal will create a fresh perspective. That new outlook, in turn, will be more likely to trigger a behavioral response. Negative frames describe a problem. What issue does your product resolve? How will your product relieve the customer’s pain? Biologically, humans are built to avoid pain. Because of that tendency, we’re more apt to notice negative stimuli (Zajonc, 1984). And that insight holds true in advertising. 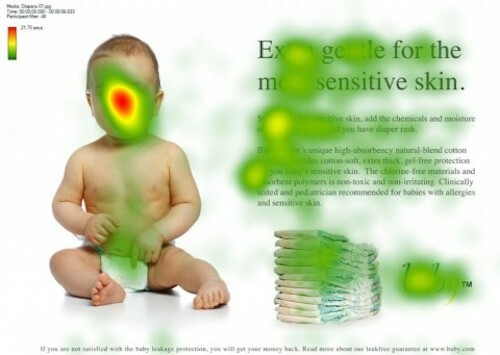 In advertisements, words with negative valences attract a higher number of eye fixations (Ferreira et al., 2011). Because people devote more processing resources to negatively framed ads, those ads can also spark behavior, such as impulse purchases (Shiv, Edell, & Payne, 1997). If your main advertising goal is some type of immediate action (e.g., clicking on your banner ad), then consider using a negative frame. You’ll attract attention more easily, and you’ll be more likely to trigger an immediate behavior. Positive frames describe the benefits that your product provides. What will customers gain from buying your product? When participants were exposed to the positively framed ads, they experienced a higher level of arousal, which strengthened the encoding of the memory. Thus, if you want people to remember your brand (e.g., next time they’re choosing a product at the store), then use positively framed ads. Your ads will generate a stronger impact on long-term memory, and people will be more likely to remember your brand. But what about rational vs. emotional appeals? Where do they fit in? Seems like a lot to remember, right? 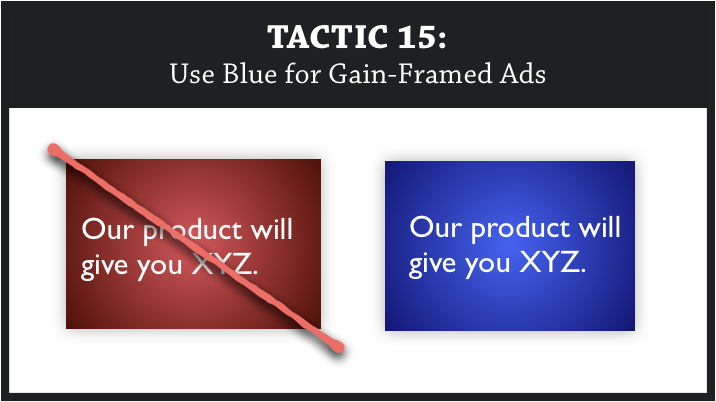 To help you pinpoint the best framing for your ad, I organized the previous tactics into the chart below. Whenever you’re creating an ad, you can reference this chart to know which frame you should use (based on your market and advertising goal). Ideally, you should expose people to slight variations of your ad. With repeated exposures, people begin to process your ads more easily, generating a stronger affinity toward your brand (Zajonc, 1968). But why create slight variations? Why not repeat the same ad? If you repeat the same ad, you’ll often trigger annoyance — especially for unfamiliar brands (Campbell & Keller, 2003). There are other reasons too. 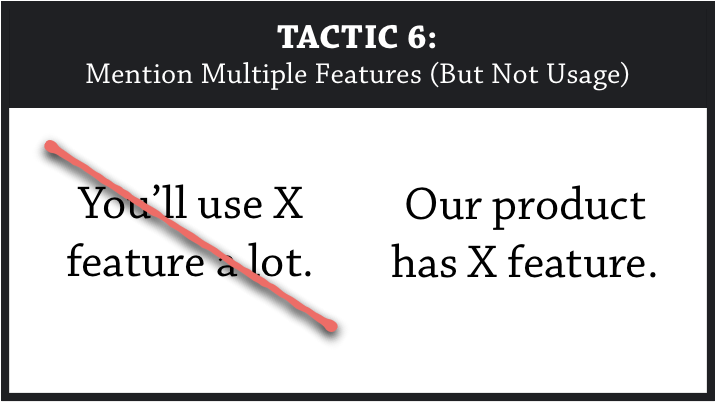 This section will explain a few tactics applying those reasons (and how you can create ad variations that will be effective). When creating a new variation of your ad, try moving your brand or logo to a different spot. Shapiro and Nielson (2013) exposed participants to multiple versions of an ad (in which the logo changed location). Even though participants failed to recognize the change, they evaluated the logo more favorably when it moved locations. When you add a slight visual change, people will subconsciously notice the change. And they’ll develop a stronger preference toward that content because of higher fluency. When choosing a model for your ad, you should choose a model that resembles the market that you’re targeting. That heightened similarity will create a stronger appeal. But why am I including this tactic within the “variations” section? Because this tactic can also help with segmentation. 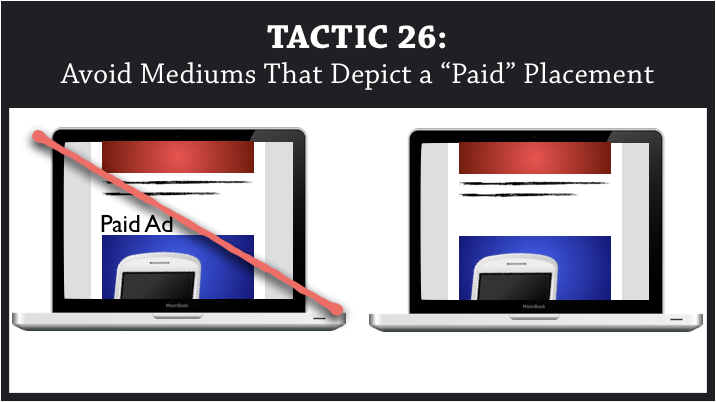 Well, this tactic can help you tailor your ad campaign. Instead of displaying the same ad to everyone, replace the model with someone who resembles a particular segment. You could keep it broad by segmenting on gender. Show female models for female segments. Show male models for male segments. 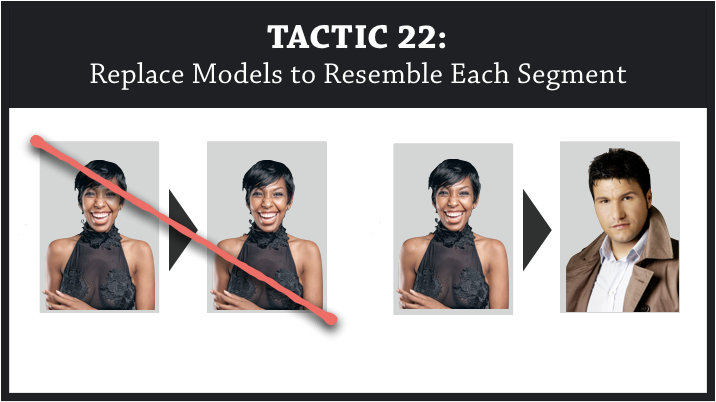 Or you could create narrower segments by showing models that match specific ethnicities. Either way, research shows that your ad will perform better when the model resembles the segment (Forehead & Deshpande, 2001). If you’re studying for an exam, you should study in increments, rather than cram the night before. You’ll encode and retrieve the information more effectively (Anderson, 2000). 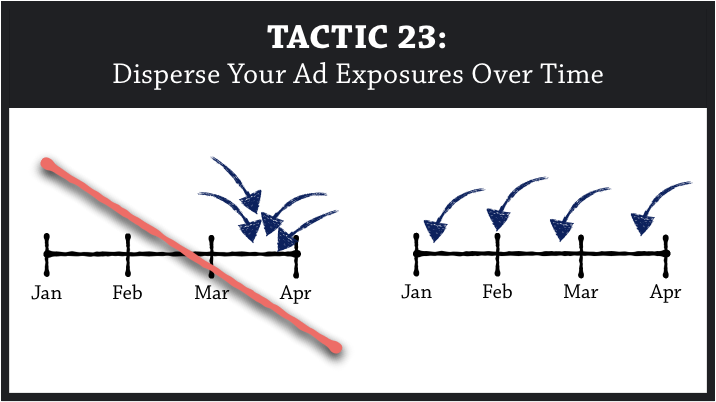 To avoid annoying your customers (and to gain the benefits of spacing effects), you should spread out your ad exposures over time. Where should you advertise your product? Like the other suggestions in the article, the best answer will always depend on various factors. This section will explain those factors so that you can choose ad mediums that will be favorable for your product. We associate small numbers belonging on the left and bottom. We associate large numbers belonging on the right and top. If you position a price on the bottom left, you’ll trigger people’s association with a small magnitude. The price will actually seem lower. Cai, Shen, Hui (2012) examined that effect with product images. In their study, they showed participants two lamps on a screen. The result? Participants estimated a higher price for lamps that were presented on the right. The same effect would occur in magazines, flyers, and other physical mediums. Green pens resulted in more choices of green products (e.g., Sprite). The color of the pen was a priming cue. When people were exposed to the orange pen, their concept of orange became activated. With greater activation of that node, their brain could process orange products more easily. That ease, in turn, enhanced their evaluation (and subsequent choice) of orange products. How can you apply that principle? When choosing places to advertise your product, choose mediums that share semantic qualities with your product. Those mediums will prime the context of your product (i.e., technology). Because that priming will increase processing fluency, people should develop a more favorable evaluation of your product. Boerman, van Reijmersdal, and Neijens (2012) even found that the duration of disclosure can make a difference. In their study, people developed more critical attitudes of an advertisement based on a 6-second disclosure (compared to a 3-second disclosure). Part of that recommendation stems from the serial positioning effect (Murdock, 1962). In a sequence of information, content will generate a stronger impact when it’s positioned toward the beginning (primacy effect) or the end (recency effect). But I’d be cautious with that recommendation. Theoretically, it makes sense. Realistically, though, some people won’t reach the end of a magazine. So the beginning might be your best bet. Either way, avoid placing your ad in the center of a medium. That position will generate the weakest impact on memory. Want to reference this guide again? Click to download the full PDF and checklist. …and let it out. Phew. You made it to the end. And I know…I threw a lot of info at you. But don’t feel overwhelmed. 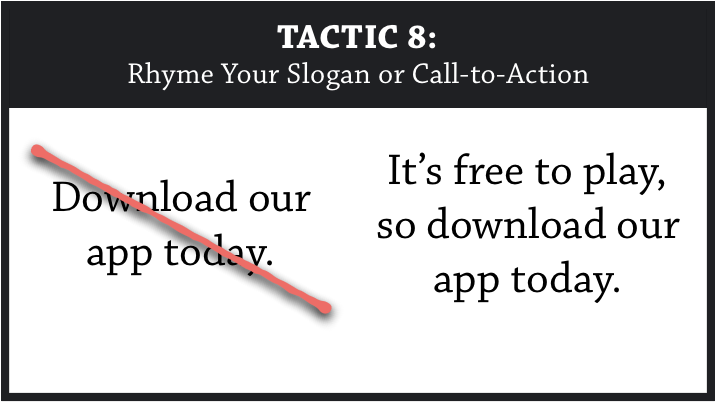 When creating an ad, you don’t need to incorporate all of the tactics. In fact, you shouldn’t incorporate all of the tactics. These tactics are merely ideas. Use this guide as a starting point for your ad. 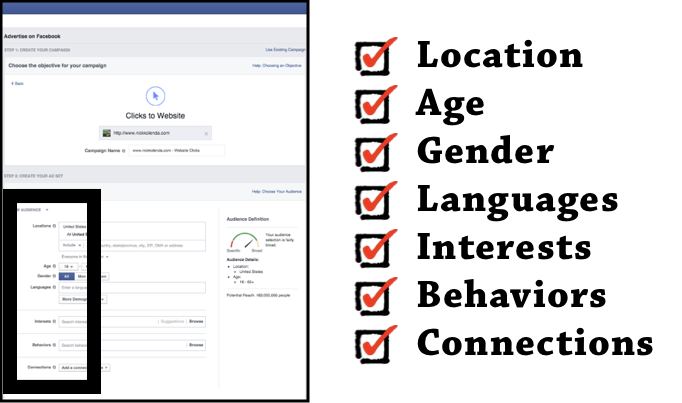 After you create the ad, then use this guide as a checklist to see if you can enhance it. If you can’t think of a way to improve your ad, then move on. Don’t force any of the tactics. Academic research is great. And it can be very insightful. But at the end of the day, common sense reigns supreme. 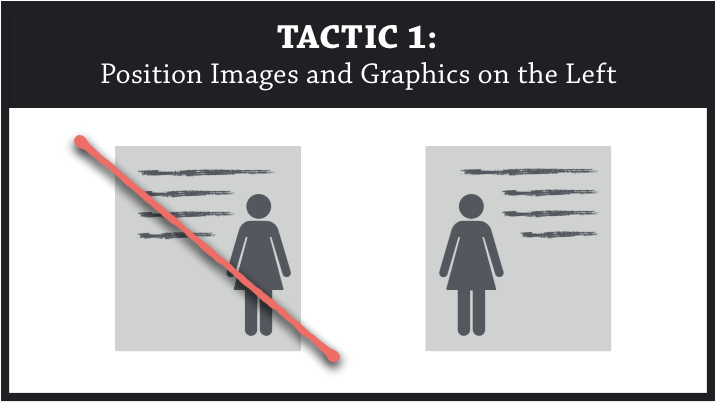 If a tactic reduces the visual appeal of your ad, then don’t follow it. Go with your gut. 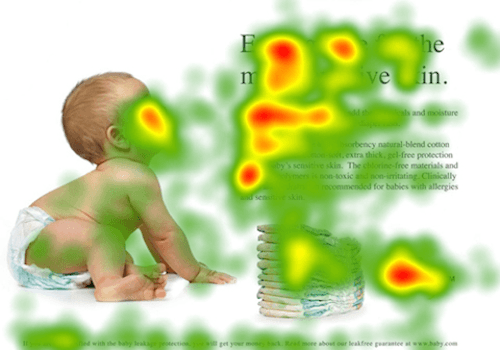 Lastly, the psychology of advertising is a huge topic —much too big for a single article. If you enjoyed the article, then you can subscribe to my blog to stay updated when I post new content.